Shopping for a new Dodge Durango? With the 2019 Durango, you'll need to pay extra for the Technology Group to get active-safety tech we consider essential. The 2019 Dodge Durango is a three-row crossover SUV that turns its nose up at minivans. With available V-8 power—and lots of it—the 2019 Durango eschews curvy crossover style in favor of Detroit machismo. For 2019, the Durango lineup largely stands pat in this generation’s ninth model year. A broad lineup consisting of SXT, GT, R/T, Citadel, and SRT trims, plus numerous options, helps keep it feeling fresher than it is. The Durango’s underhood lineup is about as vast, consisting of a 293-horsepower 3.6-liter V-6 that’s standard for most trims, a a muscular 360-hp 5.7-liter V-8 that’s more than enough for most users, and a fire-breathing 475-hp 6.4-liter V-8 in the Durango SRT. 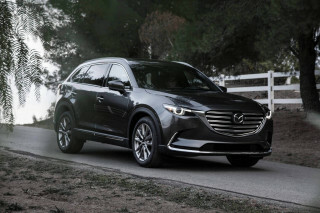 Rear-wheel drive is standard fare, with all-wheel drive optional for most configurations. An 8-speed automatic with paddle shifters puts power to the wheels. Even in its simplest form, the Durango rides well and handles with more verve than other crossover SUVs thanks to its rear-drive design. It’s heavy, but it tows well enough with the V-8s—as much as 8,700 pounds in SRT guise. No Durango is especially thrifty, especially those with V-8 power, but the 18 mpg city, 25 highway, 21 combined figures for V-6 all-wheel drive models are acceptable given the vehicle’s capability. The Durango’s interior offers good room but doesn’t match the configurable space of some more family-oriented rivals. With the third row upright, just 17 cubic feet of cargo space awaits small bags and strollers, though that grows to 43.3 cubes with the rearmost seats folded. Soft leather upholstery on uplevel trims gives the Durango a high-end feel, even as the crossover SUV’s price tag doubles from its $30,000 starting point when fully optioned. One place where the Durango lags is in safety. A four-star rating from the government and a “Marginal” rating in the small-overlap crash test performed by the IIHS raise some red flags. The 2019 Dodge Durango has a toned, muscular look not seen in other crossover SUVs. 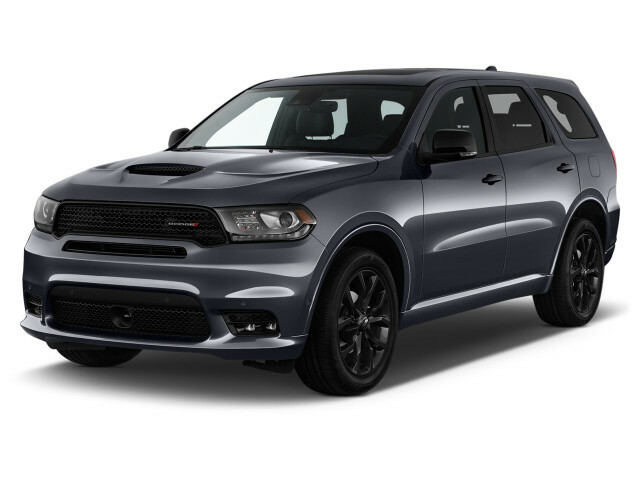 This year, the Durango GT channels its SRT big brother with the new option of the drag-racing Durango SRT’s domed hood with its functional air extractors. 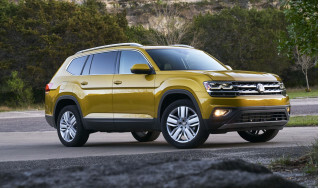 Otherwise, the look carries over with a long-roof design splitting the difference between SUV, wagon, and crossover. Hints of the long-gone Dodge Magnum persist, but the Durango mostly channels the Ram pickup lineup to good effect. A crosshair grille up front gives the Durango an 18-wheeler shape that works great on all but the Durango Citadel, which has just a hint too much chrome for us. Inside, the Durango’s look is more conservative, with a logical simplicity to its design that stands in contrast to some swoopier rivals. Front and center sits one of two touchscreens for infotainment—a 7.0-inch display standard on SXT and GT and an 8.0-inch unit that’s worth the upgrade. The Durango eschews a conventional gear lever in favor of a knob that works well enough. Leather upholstery is optional on SXT and GT trims, standard otherwise. The 2019 Dodge Durango is the automotive equivalent of a walk through the chile pepper section of your local grocery store. Base V-6 models are by comparison tame Anaheim peppers; full of flavor, but not exactly thrilling. They use a 3.6-liter V-6 that sends 293 horsepower to the rear or all four wheels (295 hp with the optional dual exhaust). The V-6 provides more than adequate power for most uses while returning upward of 20 mpg combined, according to the EPA. A 5.7-liter V-8 rated at 360 hp is optional on the Durango Citadel and standard with the sporty R/T trim. 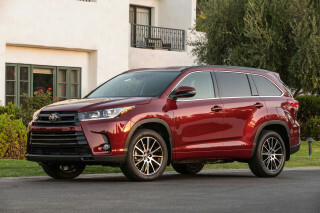 In addition to its NASCAR-worthy soundtrack, the V-8 furnishes excellent acceleration and adds about 1,000 pounds to the crossover SUV’s towing capacity—to 7,400 pounds with rear-wheel drive. Topping the lineup, the Durango SRT is a sports car for seven. Its 475-hp 6.4-liter V-8 comes from the Dodge Challenger SRT. Iit works remarkably well in this all-wheel-drive application. Thundering acceleration, paired with the ability to tow 8,700 pounds, makes the Durango SRT one of the most versatile performance vehicles on the planet. Aiding all three engines is an 8-speed automatic, a quick-shifting transmission that seems to anticipate the right gear for every situation. 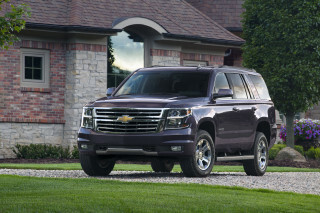 On V-6 and 5.7-liter V-8 models, rear-wheel drive is standard and all-wheel drive is optional. Though it shares much of its architecture with the Jeep Grand Cherokee, the Durango isn’t an off-roader. 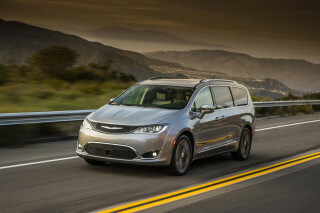 It sits lower than the Jeep and doesn’t offer a low-range for its all-wheel-drive system. The Durango’s thick-rimmed steering wheel and well-bolstered seats hint at more handling prowess than a typical crossover. In SRT and even R/T guise, the Durango is downright entertaining to hustle along a curvy road or even a racetrack. Other models steer with the same precision but have the benefit of a softer ride. Rarely does the Durango’s driver forget that this is a tall-riding crossover SUV, but its impressive composure betters nearly every other three-row vehicle on the market. The 2019 Dodge Durango has an exceptionally roomy cabin for four, but it’s tight for more. The Durango’s interior is well-appointed, especially at its roughly $31,000 price of entry. Soft-touch materials with a pleasing sheen dominate its dash, while luxo-spec variants Citadel and Durango SRT feature soft leather trim and synthetic suede that wouldn’t be out of place in a Mercedes-Benz. The front seats are firm and supportive, with good adjustment. Row two is also comfortable with decent legroom, but three abreast on the standard second-row bench seat can be a tight squeeze. A better choice for most buyers is the individual captain’s chairs that are optional on most Durango trims. A third row is standard on all but the base Durango SXT, where it’s an option. Choose wisely: the third row is tight for adults and older children and not especially easy to access. At least the 60/40 split seats drop quickly at the tug of a lever or the press of a switch on higher-spec trims. With the second and third rows folded flat, the Durango boasts 85 cubic feet of storage capacity. Keep row two upright and that figure slides to 43.3 cubes. However, with the third row deployed, just 17 cubic feet of storage volume exists, with much of that above the window line. The 2019 Dodge Durango’s dated design doesn’t perform as well in crash tests as some rivals. The Durango checks all the typical boxes for safety gear, including active head restraints that reduce the risk of whiplash. However, advanced tech such as automatic emergency braking, active lane control, lane-departure warnings, and adaptive cruise control are bundled in a $2,600 package on the Durango when they’re standard fare or much less costly on most rivals. Moreover, the Durango’s four-star overall rating from the NHTSA and a “Marginal” rating in the IIHS’ small-overlap crash test serve as further blemishes that raise an eyebrow and remind us that the Durango’s basic design dates back nearly a decade. The 2019 Dodge Durango offers a model for every need as well as plenty of options worth sorting through. The base Durango lacks for little given its $31,000 price. A 7.0-inch touchscreen for infotainment, a host of USB inputs, three-zone automatic climate control, five seats, and keyless ignition are all standard. We recommend starting at the Durango GT, however. Aside from unique styling, third-row seating, and 20-inch alloy wheels, it doesn’t add much to start, but the Durango GT serves as the gateway to far more options such as active-safety gear, second-row captain’s chairs, leather upholstery, and an 8.0-inch touchscreen for infotainment with Apple CarPlay and Android Auto. The Durango R/T layers on the V-8 engine, sportier suspension settings, more heavily bolstered seats, and more in its quest to be a performance car for those with kids. At the opposite end, the Durango Citadel impersonates a luxury car well with its nappa leather upholstery and front seats that are both heated and cooled. The Durango SRT adds to the R/T a host of additional features, not the least of which is a 6.4-liter V-8 that’ll make the first stop after carpool the local dragstrip. A trailer hitch and rear load-leveling shocks are bundled together as an option for every Durango variant. Stick with the V-6 and the 2019 Dodge Durango delivers reasonable fuel economy. Durango V-6s are rated at 18 mpg city, 25 highway, 21 combined with all-wheel drive. 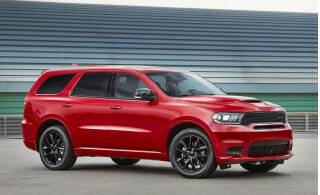 The rear-wheel drive V-6 Durango is rated at 19/26/21 mpg. The V-6 engine comes standard on Durango SXT, GT, and Citadel trims. The 5.7-liter V-8 optional on the Durango Citadel and standard with the R/T will have you stopping at more gas stations. It’s rated at 14/22/17 mpg, regardless of rear- or all-wheel-drive configuration. Notably, the 5.7-liter also runs on mid-grade fuel rather than the regular unleaded used in the V-6. The range-topping Durango SRT comes in at 13/19/15 mpg, which isn’t all that terrible considering its power. Looking for a different year of the Dodge Durango?